How Much Does a New Garage Door Cost in 2019? There are a lot of options for garage doors and openers. The price can go from inexpensive to very costly. We will give you the information you need to make an informed decision about the exterior item can make up 35 to 40 percent of the curb appeal of your home for the next 10-15 years. 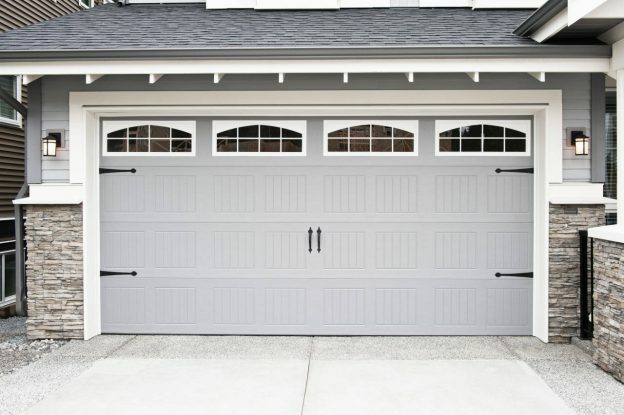 There are many types and styles of garage doors to consider. The door you choose, the material used, customization to the door, opening adjustments, and the labor or DIY install will affect the price. However, you can look to pay between $500 for an inexpensive steel or fiberglass foam-filled door, to a more expensive, classic wood door with beveled glass panels that could cost $2,500 – $3,000 per door. Electric door openers, screens, and installation could also increase the price. Classic wood – these usually come in hemlock, cedar, and mahogany. These are also the most expensive but look great and last longer than some other types. Steel – these are the least expensive and most common. Consider getting foam insulation with an R-value of at least 12. Vinyl – these have recently increased in popularity because they look better and do not dent as readily as steel. You can also buy them to look like natural wood. Wood composites – these too are rising in popularity because they’re easier to customize with paint and others. Insulation is a crucial consideration when the garage is attached to the house. If you are buying steel, fiberglass, or vinyl, consider buying or adding a higher R-value. It will save you money on energy over the years. Insulated doors cost between $800 and $1330. High R-value doors can be found at a local home center in the $1700 range. Swing-up – this is a one-piece door that swings out and then up. Roll-ups – this is the most popular because it is a sectional and easily worked by remote. Swing-out – these are not as well-known as others but great for overhead storage because they swing out from the center and save the space overhead. Sliding – this two-door style slides up. Windows in the top or third panel of the garage door are the most popular customization made to doors and typically come with frost or tinting for privacy. These windows add natural light inside the garage and look fabulous. You might want to consider making your garage door resemble a horse stable, barn doors, or French doors with all shatter-resistant glass. Getting the barn doors that slide to the side, rather than roll up are quite unique. Of course, these can get very expensive, but the style adds tremendous curb appeal. There are also many different types of screens you can consider adding, which can add $50 – $1200 to your door, but these will keep out the bugs. If you have the tools, time, knowledge, and a couple of good friends willing to help, you can do a garage door install yourself. However, too many things can go wrong with a garage door installation, and some of those might even void your warranty. Some new garage door sales will offer “free installation” as a part of the sales price. Checking similar doors with other dealers will give you an indication if the installation got built into the price. Otherwise, expect to pay $200 – $500 for an install, depending on the size of the door. A single door is a little cheaper to install than a double door. Garage door installations as a DIY project can take two or three people approximately eight or nine hours to complete. However, professional installers will usually charge you ten hours to install. That’s generally two technicians working for five hours. For a single door, figure $500 – $800 and around a $1000 – $1200 for double doors. Garage door openers have three basic opening drives, belt, screw, or chain. Wall-mounted is also an option for torsion spring setups and saves space overhead. Most modern door openers are now belt-driven because it is much quieter than the old chain or screw models. Openers can range in price from $150 to upwards of $500. There are some innovations such as smart and green technologies that are worth paying a little more for initially. Likewise, if you are buying a new door and trying to keep the same opener, make sure the old opener can handle the weight of the new door. Some new doors come with only one electric opener, so you may need to purchase another. Also, garage door openers often come with assembly and installation videos. If you have the tools and time, DIY is an option. One final note: if you’re considering adding an epoxy floor to your garage, check our cost guide for materials and prices before you get estimates, so you know what the difference between epoxy and “epoxy paint” is.